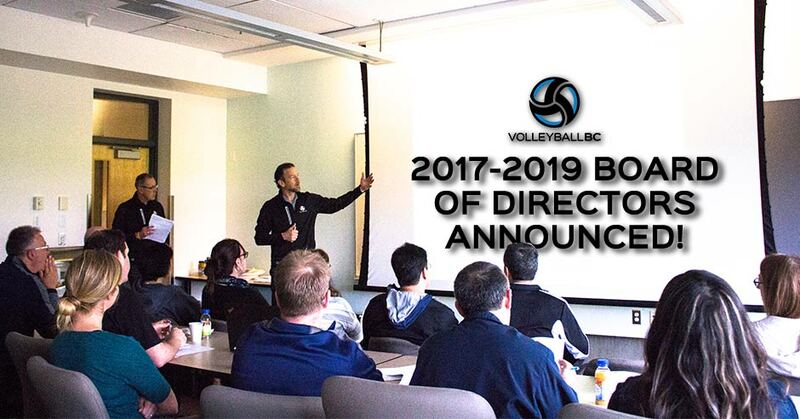 Volleyball BC is pleased to announce some new appointments to the Board of Directors for 2017-2019. 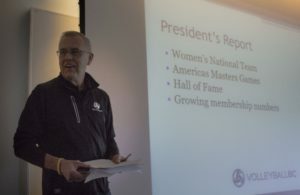 Volleyball BC Board of Directors is a policy governing board, which sets policy and hires a Chief Executive Officer to implement policy and the day-to-day work of the organization. The Board is accountable to the membership of the organization and is elected to serve for a term of two years. 1. 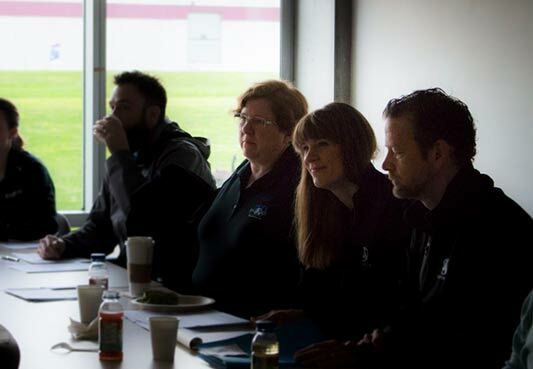 Meeting Participation – The Board Member is expected to participate in all meetings of the Board including conference calls and face-to- face meetings. 2. Committee Participation – The Board Member is also expected to actively participate in one or more VBC Committees, as amended from time to time. 3. Be Informed – The Board Member must be informed about the affairs of the organization to properly perform their duty to act in the best interest of the association. The expectation is the Board Member prepares for each Board conference call or meeting by reviewing all material provided by the CEO. The Board Member is also expected to listen to, engage with and share the needs of the membership. 4. Conflict of Interest and Confidentiality – The Board Member shall not participate in any organization decision when the Board Member has a material financial interest in the transaction in question without first informing the Board of the interest and following proper procedures. 13 key skills have been identified as preferable skill sets for Volleyball BC board members. These are not essential for each board member to possess, but as a collective, the board should have these skills. The nominating committee will use a matrix when recruiting new board members. Boris brings more than 30 years’ experience at all levels, school, club, provincial and national to the Board. He has been a player, coach and board member and has a comprehensive understanding of both the indoor and beach games. As a senior lawyer, with significant experience in dealing with complex issues and sensitive negotiations, Boris provides the Board with legal, analytical and strategic skills. As an experienced Board member, he advises on governance and broader strategic issues. Rob joined the board of Volleyball BC in 2014 and assumed the role of Treasurer later that year. He is a Chartered Professional Accountant and over the past 20 years has worked in senior finance roles for companies in Japan, the USA and Canada. He is currently the CFO of Tokyo-based Minkabu, Inc., a global technology, and media company and is a director of Gatekeeper Systems, Inc., a BC based public company for which he chairs the Audit Committee and is a member of the Compensation and Nominating & Governance Committees. Rob grew up on the North Shore where he participated in many sports before attending UBC to play volleyball for five seasons including two as team captain. After graduating from UBC, Rob remained active in the program for five years as an assistant coach with the junior varsity and varsity teams under Dale Ohman. Rob currently resides in West Vancouver with his wife Annie and their three children. Lies has been an active member of the Volleyball community in BC since moving here from Calgary in 1999 to play volleyball for Trinity Western University. She began with the Canadian National Team program in 2002 playing for Lorne Sawula and Naoki Miyashita until 2007. She continued to play professionally after beginning her family in 2008 and played overseas until 2010. Since then, she has been the Assistant Coach for the Trinity Western Women’s Volleyball team and has had 4 children. She has been involved in the bid process to Bring the Women’s National Team to BC since 2013 and is excited to see how the team’s presence will support the growth of Volleyball in BC. She hopes to see many young women learn life lessons from this amazing sport, just as she has over the years. Ryan holds a Ph.D. from the University of British Columbia where he played volleyball as a Thunderbird. He has a passion for small business and since graduating from UBC has been actively involved in taking four software start-ups from idea to profitability. Ryan serves on the board of two BC corporations and is indirectly involved in a number of other business ventures either as an investor or mentor. In the winter Ryan plays indoor volleyball for the Canadian Men’s Masters team. In the summer he plays beach volleyball on the Volleyball BC pro-circuit. Ryan is also very involved with the Kits Beach Volleyball Association where he serves as a Director. As of 2016, he holds the dubious distinction of being the oldest player to win a Cliver event at Kits Beach! Doramy brings over 30 years of volunteer experience within the Sport System in Canada. Her involvement with the sport of volleyball started in the early 1980’s where she was involved with both the JR and SR National Team programs. She then turned her focus onto the Sport Sector, where she gained valuable knowledge and experience working for Sport Canada, CIAU, and the Government of Canada. During this time, she volunteered in a variety of Mission Staff roles from 1989-2000. After her many years of working for the Government of Canada, Doramy moved onto to work for the Rick Hansen Foundation, where she currently holds the position of Executive Vice President. Over the past eight years, she has given back to the Sport Sector in BC serving on the boards of Sport BC, Pacific Volleyball Society, Air Attack and Volleyball BC. Rayel’s volleyball experience began in the club system, playing for Fraser Valley Volleyball Club and winning two national championship titles. As a direct result of this, she was able to attend the University of British Columbia and contribute to a five-time CIS National Championship program, acting in the role of Team Captain in her fifth and final season. Between these seasons, she was able to play with Team BC Indoor for a number of summers gaining Baden Cup, NTCC and Canada Games experience. In addition to an amateur playing career, she has also been a volunteer coach in the club and PacWest system, coaching for the Ducks, Thunder and Seaside Volleyball Clubs along with two seasons at Columbia Bible College. Rayel’s background and varied experience will enable me to provide guidance to Volleyball BC in the areas of HR, leadership development, and strategy. As we look to build on our 2016-2019 Strategic Plan, she will be able to bring a strategic focus to the operational and people side of the strategy. Her playing and coaching experience within the purview of Volleyball BC gives her a unique perspective as a business leader, club administrator, player and coach; in bringing all four of these views together Rayel believes that she can help create the most fulsome solutions possible. Brian bring his volleyball experience from high school, club, college, university and provincial team levels which bring a varied and global picture of the positive impact the sport can have on an individual’s development. His high school administration career and sports administration experience have provided him with many opportunities to develop an appreciation for the need of consistent decision-making and visionary governance to ensure a healthy and growth-oriented organization. Since his first exposure to Volleyball BC in 1988, Brian has always admired the morals and values of the organization as it strived to promote the sport through youth development, elite development, and adult recreation. These values and morals are a reflection of the Board of Directors adherence to its mission, goals and values. Volleyball BC is a non-profit organization that actively encourages participation and fosters the development of volleyball in BC. As a provincial sport governing body, we are dedicated to making volleyball accessible to all British Columbians. Volleyball BC offers programs for athletes of all ages ranging from grassroots to high performance, as well as coaches and officials. As part of our mission, Volleyball BC is proud to host provincial, national and international events to showcase the sport of volleyball to all members of our province.